About an hour and a half before our arrival, the flight crew turned the cabin lights back on and began serving breakfast. Breakfast included a fruit cup, yogurt, fruit bar and juice. Very soon, we were circling Gatwick Airport on a cloudy Saturday morning. The glimpses I got of the green English countryside belied the cramped, bustling London streets we soon would trod. Our plane landed right on time and we disembarked. The line to get through customs was long, and in spite of a large number of customs agents, we waited for around 30 minutes. Once we passed through customs, we went down the ramp to the baggage claim area and immediately located all of our bags. Susan had purchased some bright yellow luggage tags and they made it easy to distinguish our bags from all the rest. We exited the baggage claim area and located the Hotelink desk, where a very nice lady took our name and gave us instructions on how they would get us to our hotel. Susan had pre-arranged for ground transportation from Gatwick to London. The airport is a good distance from the city, so you’ll need to carefully consider how you get to into the city. A taxi would be around 100 pounds, while the Gatwick Express was only 23 pounds per person. We waited about 15 minutes. During that time we conducted our first transaction using British coins by purchasing a product made by a company based in our hometown of Atlanta–Diet Coke. We had already exchanged American dollars for British pounds at an American Express travel office back in Atlanta. But they only had bills, and the smallest British bill is a 5 pound note. The drink machine didn’t take paper money, only coins. So I found a currency exchange counter and the women there was able to give me change for a 5 pound note. 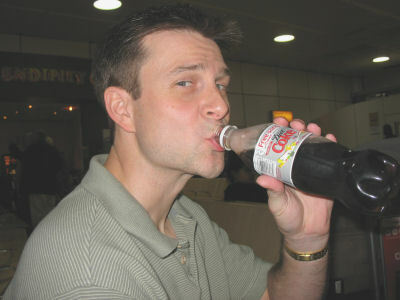 I bought the Diet Coke, which I believe was 2 pounds, and we relaxed. Finally the Hotelink rep was ready to go, and she escorted us and another couple to the train that moves passengers between terminals at the airport. Another Hotelink representative was waiting for us at the other end, and he escorted us through the terminal out to the express train that took us all the way from Gatwick to Victoria station in London. The train was comfortable, with a table between seats. This was a commuter train, not a subway. The trip is above ground. 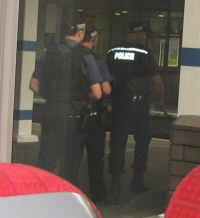 Before the train left the station some police officers, armed with what looked to my untrained eye to be machine guns, walked through our car. They had what I guess was a bomb sniffing dog come to us and sniff our personal belongings and luggage, then they moved on. I thought I saw the dog nearly pass out when he sniffed my shoes, but he was a trained professional, and maintained his composure. As we were reaching the end of our train ride, rain began to fall. So our first day in London was going to be cold, rainy and windy. The train came to a stop and Hotelink reps were waiting just outside our car. They obviously know exactly where the train will stop each time. The men got all of our luggage out, and one of them escorted us to a waiting minibus or minivan. He began driving just us, as the other couple was bound for a different hotel in a different minivan. I asked the driver, “What’s the one thing we shouldn’t miss while in London?” He answered, “Well, I don’t know you and what you like to do, so I can’t recommend anything.” So I asked again, “What’s the one thing everyone should do in London?” Again, he answered that he just couldn’t say, since he didn’t know what we liked. Strange. I guess he just didn’t care. The driver did tell us that we were staying in a very nice hotel, and that it was close and convenient to many different attractions. Oh yeah, he was happy to tell us he didn’t like Tony Blair. 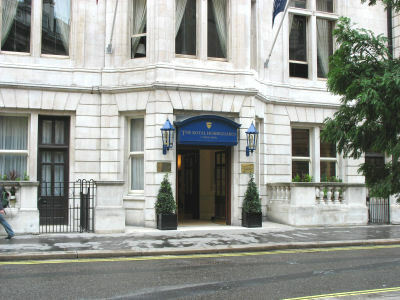 We soon arrived at our hotel, the Royal Horseguards, got out, tipped the driver 3 pounds (Tip: make sure you have some coins for tipping. I wasn’t prepared to tip someone a 5 pound note when they couldn’t suggest even one thing for us to do in London! ), and took our bags inside. The unassuming entrance to the hotel hardly looked like a hotel entrance by US standards. The simple, yet elegant lobby was only partially full, but surprisingly so considering the early hour. We had arrived about 9:30 a.m., London time. Check-in time was 2 p.m. so it was too early to actually get our room. We took care of the paperwork for check-in, and left our bags with the concierge desk. Susan was hungry since she only ate part of her breakfast. So she wanted to eat before we went out. We went to the hotel’s dining room, which serves a breakfast buffet. The buffet is included in our room but since we weren’t officially checked in, we had to pay this morning. I had a feeling this was a bad idea, knowing how hotel food tends to be overpriced. We ate breakfast, which I enjoyed. It was more than just a continental breakfast, and included fruit, two kinds of eggs, sausage, Canadian bacon, baked beans, cooked mushrooms, cooked tomatoes, oatmeal (I think or maybe they call it porridge), several different cereals, croissants, pastries, and juice (orange, pineapple, tomato and apple). The servers offered to bring toast to the table, and there’s plenty of preserves on the table to go with the toast. The servers also bring hot tea or coffee to the table. We finished eating breakfast and requested the bill (they call it a “bill” here, not a check). The cost? 35 pounds. This was $68. For breakfast! The realities of London pricing had set in, but this was exaggerated as I think most hotel food is overpriced. After breakfast, we started walking toward the Churchill Museum and Cabinet War Rooms. 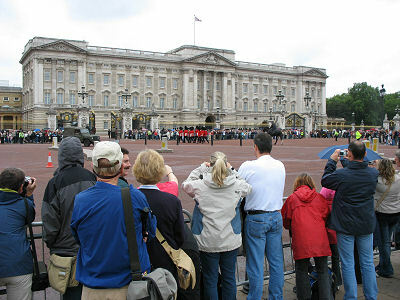 We were detoured when we walked past the Royal Horseguards (the namesake of our hotel), and decided to have a look. 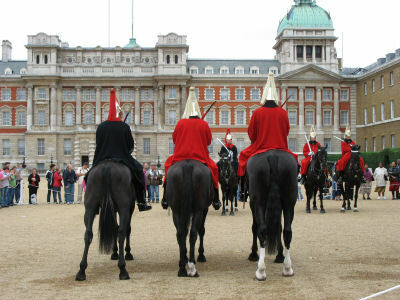 We lucked out, as the guards were mounted up and starting the changing of the guard. We walked out into the large open yard and watched the procedure, which involves two horses walking out together to the end of the yard, then walking back. I didn’t see everything so I don’t know exactly what they were doing, but they finally finished that particular portion of the “pomp” and all the horses and riders headed out Horseguards Road, then down The Mall toward Buckingham Palace. We didn’t realize at first what was going on, since we just arrived in London and hadn’t yet learned our way around. Most of the crowd was following quickly, taking a shortcut through a beautiful green park, named St. James Park. We walked as fast as we could but the horses beat us to the palace. It didn’t matter though. There were already a few thousand people waiting to witness the changing of the guard, so we could not get near the front of the palace to see. We walked around and stopped on Spur Road, watching to see what would happen. After waiting and waiting, we got tired of waiting, so we stopped waiting and left.